In chapter 7 the wall is finished. The city is safe, but not yet alive. In chapter 8 the people long to know God so they ask Ezra the priest to teach them the Law. 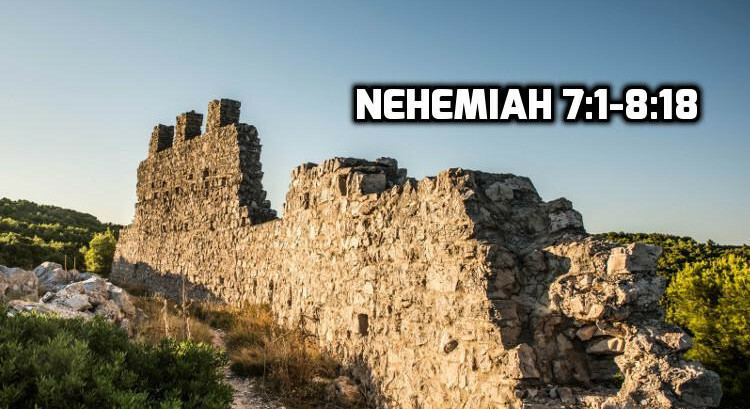 Nehemiah 7 is essentially a genealogy. It’s a list of the families of the repatriates and their origins. Like the names in chapter 3, we want to ask why. Chapter 7 is a monument to God’s care of Israel even during the exile. “Nehemiah picked Hananiah not because he was a relative, but “because he was a man of integrity and feared God more than most men do” (Nehemiah 7:2). They have a renewed chance at a national identity as the people of the God of Abraham and they are guarding that, not their homes (Nehemiah 7:3). The city is rebuilt, but is it not alive (Nehemiah 7:4). Chapter 8 records a revival and in it we meet Ezra for the first time. Revivals are a gift from God. The people longed for God because they had been touched by God. At this point Israel becomes a people of the book, not the temple. Myth #1: The Bible is too hard to understand. Myth 2: There’s one best physical expression of worship. Myth 3: The right kind of music must be present to have worship. Myth 4: Christians are a miserable lot. Now that the city is rebuilt, God reminds them their home is not on earth.